The great Glinsk elder, Schema-Archimandrite Seraphim (in the world, Ivan Romanovich Romanstev), was born June 28, 1885 in the village of Voronok, Krupets region of Kursk Province, to a peasant family. In August, 1910, after his parents had died, Ivan entered Glinsk Monastery. In 1914, he was enlisted in the army and fought in the First World War. In 1916 he was wounded and after recovering returned to the monastery. In 1919, Ivan Romanstov received the monastic tonsure with the name Juvenaly. After Glinsk monastery was closed in 1922, Fr. 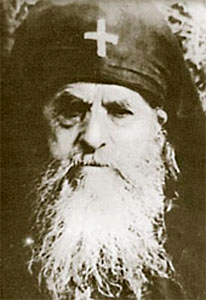 Juvenaly moved to the Drandsk Monastery of the Dormition (Sukhumi diocese, Abkhazia), where in 1926 he was ordained a hieromonk and tonsured into the great schema with the name Seraphim. However, the Drandsk Monastery was also soon closed. Until 1930, Fr. Seraphim lived near Alma Alta and worked as the guardian of an apiary. The armed forces did not arrest him, and did not send him to build the White Sea Canal. From 1934 to 1946, Fr. Seraphim lived in Kyrgyzstan. He celebrated Divine Service at night, confessing and communing the faithful during those services. On December 30, 1947 Fr. Seraphim returned to Glinsk Hermitage (which had just reopened), and in 1948 Archimandrite Seraphim (Amelin), seeing his spiritual experience and perfection in monastic labors, appointed Hieroschemamonk Seraphim as father-confessor of the brothers. The elder had a special spiritual gift for hearing confessions, for calling people to complete openness. He received with particular fatherly love those who were tormented by woes, sorrows, and despondency, and those who did not know what path to take in life. Fr. Seraphim was able to make people perceive that earthly life is only the podvig of temporary wandering on the path to eternal life; he called people to a life that is Christian, perfect, and lofty. People came to him from all ends of the Soviet Union. The elder's own humility was remarkable. He never ascribed anything to his own gifts, or considered himself a man of special prayer. The elder's day began at 2:00 a.m., when he did his cell rule, and then attended the services from beginning to end, after which he gave himself over to service of his neighbor: he received pilgrims, assigned them places to live, confessed them. At night he answered letters. He copied excerpts from the holy fathers and blessed his spiritual children to do the same, and he would send the copies later to others. Love inspired him to selflessly care for every soul. He was a great God-pleaser and a true pastor. Not only monks and laypeople came to him for advice, but even bishops, who saw that he was not a man of the flesh, but of the spirit. After Glinsk Hermitage was again closed, Fr. Seraphim moved to Sukhumi, where he continued his labors as an elder in the capacity of father confessor of the Cathedral. Multitudes of the faithful came to him there. On January 1, 1976, the grace-filled elder peacefully gave up his spirit to God.